Should the Fair Work Commission account for cultural values in resolving unfair dismissal disputes at a conference? In the 1960s in England, police decided to no longer investigate illegal gambling houses, despite an epidemic. Mr Blackburn, a Member of Parliament, sought a writ of mandamus compelling them to do so. His efforts give rise to a series of applications in Australia for writs of mandamus directing the Commissioners of various police forces to investigate various grievances. No such application has been successful. This article examines those cases and identifies the barriers to success in these types of applications. Concepts such as the nature of the public duty held by police and the breadth of police discretion feature in that discussion. The article further argues that the law does not absolutely preclude success, and that courts should engage in a minimum threshold of review of police decisions in order to control police power, maintain accountability, and importantly, to review and bring into the public light the low visibility decisions to not investigate, that is, police inaction. Administrative tribunals are usually granted many novel procedural powers such as a power of a tribunal to inform itself as the tribunal thinks fit. These powers are typically granted on discretionary terms and are intended to help tribunals achieve their key goals, which is to provide justice in a less formal but fair manner. The requirements of fairness can restrict the exercise of novel procedural powers such as ones allowing tribunals to inform themselves as they think fit. This article examines statutory powers of tribunals to inform themselves and argues that those powers clearly authorise tribunals to take small steps to clarify or confirm matters already in issue. The article argues that fairness is the guiding principle for the exercise by a tribunal of a power to inform itself as it thinks fit. The article also argues that the statutory powers of tribunals to inform themselves means that tribunals should rarely, if ever, need to rely on the doctrine of official notice as an alternative way of informing themselves. Jurisdictional error has come to occupy a canonical place in Australian jurisprudence. 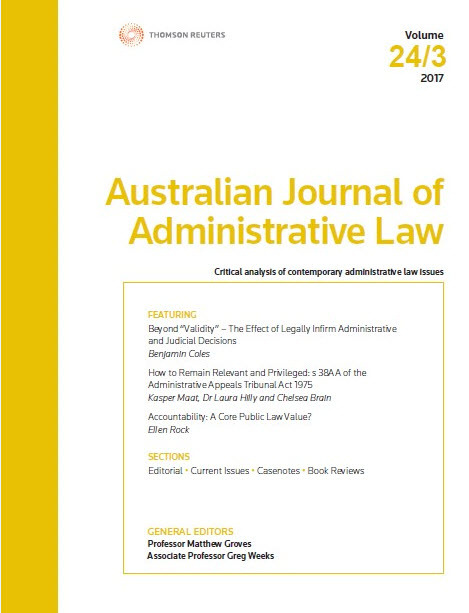 After the failure of “privative clauses” – directed to courts’ jurisdiction to issue remedies and conduct judicial review – a new legislative device has arisen, called “no-invalidity clauses”, that expands the original decision-maker’s jurisdiction to make an invalid decision, turning a “mandatory” duty into a “directory” one. This article examines the implications of this approach by first considering whether, given the prominence of jurisdictional error, the High Court still “holds all the cards” in relation to protecting against no-invalidity clauses. It then discusses how the courts might go about attempting to guard the minimum entrenchment of judicial review in relation to “broad” no-invalidity clauses at the State level, with reference to Kirk v Industrial Court (NSW) (2010) 239 CLR 531. It then embarks on a policy discussion about the likely impact if such clauses were allowed to stand.